Distance in italics is for the original canal measured from Wolverhampton or Anglesey Junction. Miles and furlongs - don't have a clue? Those were the measurements when the canals were built. In metric a mile is 1.61 kilometres. A furlong is an eigth of a mile or 200 metres. The other distances used are for the route when restored and realigned in places by LHCRT. Friar Bridge - at the start of Cannock Extension branch. The sign indicates what was the plan for connecting a restored Hatherton Branch Canal to the W&E. Due to various problems the LHCRT now plan that a connection to the W&E will be a little farther along the route to Wolverhampton. 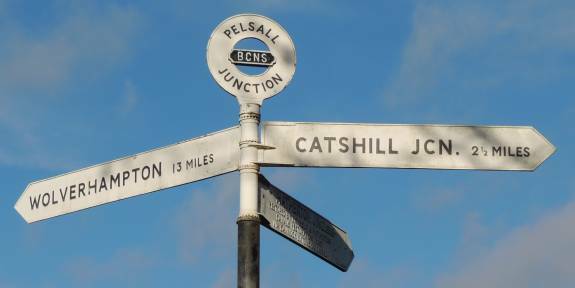 Pelsall Junction - 12 miles 7¼ furlongs from Horseley Fields Junction, Wolverhampton. Access from Pelsall North Common and the Cannock Extension branch via footbridge. 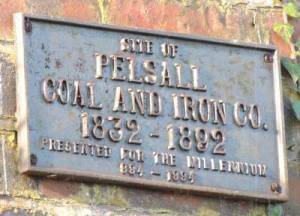 Access from Pelsall via Nest Common. Straight ahead over the footbridge to the Cannock Extension branch. ( See Virtual Walks-6 ). 12 miles 4¼ furlongs from Horseley Fields Junction, Wolverhampton. 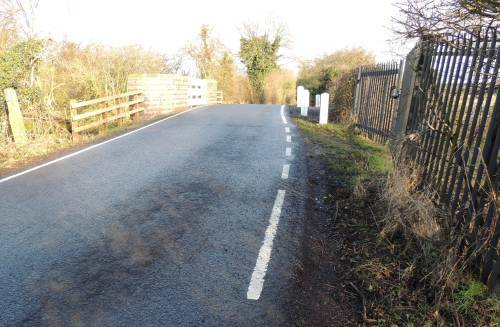 Access from Pelsall via Wood Lane and Nest Common (on the left). Access from Pelsall North Common (on the right). 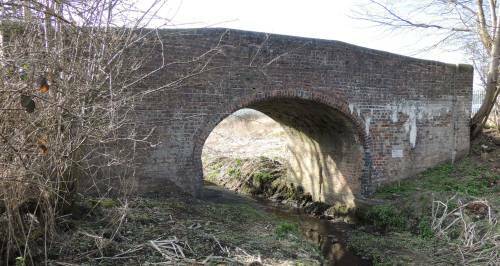 The bridge is dated "1824"
12 miles ¾ furlong from Horseley Fields Junction, Wolverhampton. The turn into the (currently infilled) Lord Hayes Branch is on the right of the photo. Taken looking SouthWest - 17/1/2014. 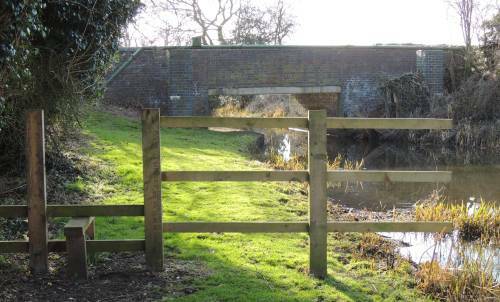 The plan for connecting a restored Hatherton Branch Canal to the W&E was to be via the Cannock Extension branch. ( See Virtual Walks-6 ). Due to various problems the LHCRT now plan that a connection to the W&E will be here via the Lord Hayes Branch. 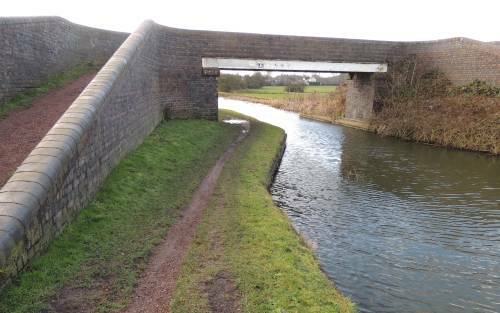 12 miles ½ furlong from Horseley Fields Junction, Wolverhampton. Access to the (currently infilled) Lord Hayes Branch (to the right of the photo) via the footbridge. Taken looking NorthWest - 17/1/2014. Access to the (currently infilled) Lord Hayes Branch via the footbridge (out of shot to the left of the photo). A footpath follows the line of the canal. 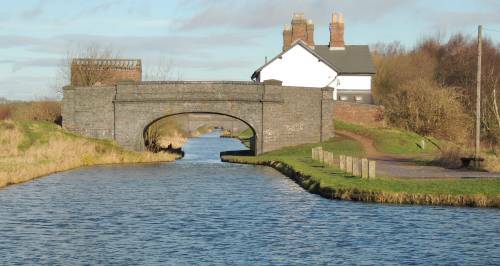 The Lichfield & Hatherton Canals Restoration Trust campaigns for the restoration of the Hatherton Canal from the Wyrley and Essington, through the Cannock / A5 area to meet the Staffordshire and Worcestershire Canal at Hatherton Junction, Calf Heath. It promotes the restoration as public amenities for boating, angling, walking, cycling etc. and raises funds to carry out physical restoration work. Taken looking NorthEast - 17/1/2014. POOR access via Fishley Lane (do not fall into the pond!) to the right of the photo. Taken looking NorthWest from Fishley No. 1 Bridge - 17/1/2014. 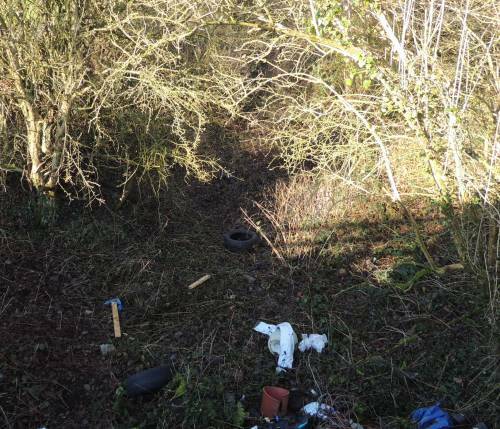 Although overgrown the line of the canal is still traceable. The next section follows the original line and access to the towpath is available from here (Roman Way) to Scrawpers End Bridge, Oak Lane. Taken looking West toward Hatherton Junction - 21/3/2015. Access (for pedestrians ONLY) via the Roman Way Hotel on the A5 West of Cannock. Taken looking East back toward Churchbridge - 21/3/2015. Bridge No 7 (demolished) - Bridge narrows will remain. Taken looking SouthWest toward Hatherton Junction - 21/3/2015. and along the towpath from the East. NOTE low headroom under the bridge! 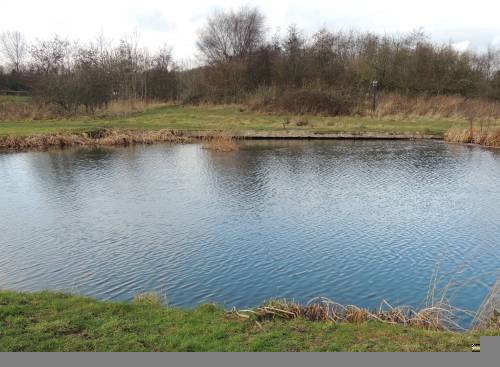 A feeder channel runs to the Gailey reservoirs. Taken looking NorthWest just before Scrawpers End Bridge - 21/3/2015. The final section follows the original line to Hatherton Junction.